Hello, my name is Bernard, and I am the owner of Rockin’ It DJs which I have been running as an independently owned-operated business since 1983. I have been a music lover and collector since my teenage years. My life as a DJ began when my friends and family pestered me for copies of my mixed tapes for their parties back in the late 1970s. Since then, very little has changed for me. I still listen to music because I love it. I still use records and turntables because of the warm sound they produce. I still use CDs because of their superior digital quality. I still have eclectic tastes and buy all different types of music. I still DJ because it’s still lots of fun. I still get pestered by my friends and famliy. The majority of my business is providing music and mood at all types of wedding receptions. I work with you through every step of the planning process and program. I am an experienced MC with a wonderful baritone voice and an endearing sense of charm. My job is to ensure that you can kick back and have a great time while I keep the party going and the spirits high. I treat your wedding reception with the respect it deserves by: setting up early, testing my equipment ahead of time, having back-up equipment available, dressing professionally and working in unison with the caterer, photographer and other professionals. Are you looking for a terrific birthday, anniversary, or office party? Rockin’ It DJs can create the party that you want. 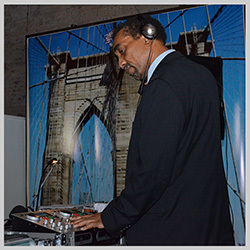 Whether you are planning to rent a club, church basement, ballroom, loft, bar, restaurant or phone booth, I can spin any and every type of event. Club, Lounge, Hip Hop, Oldies/Retro, Cutting Edge, Latin, or anything different and unique. Rockin’ It DJs also provides PA for speaking programs, small bands and performers. I am experienced in sound technician and regularly provide sound for wedding ceremonies and parties that I share with singers, bands and other performers. I am not an entertainer, crowd motivator or dance coordinator. I do lively MCing and always let the music do the talking. I do not have a gigantic sign or table with my company logo on it. I find that a bit tacky. It’s your event, I am not nor should I be the center of attention. I do not do stand up comedy at your wedding or event. I do have a wonderful sense of humor but I also show good judgment at your fun, intimate event. I do not play a lot of “cheesy” music. I try not to get swept up in the fads and hype of our very challenged music industry.